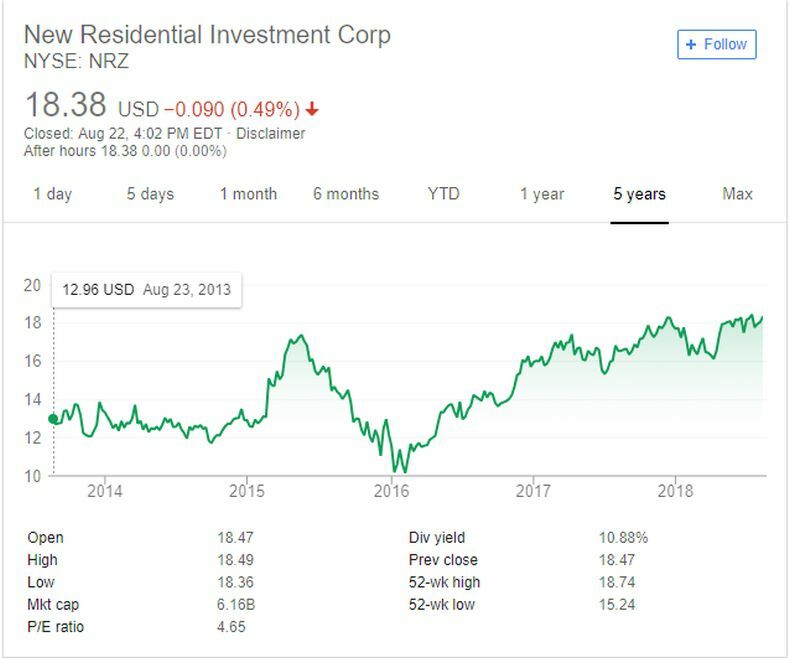 On August 22, 2018, I bought 27 shares of New Residential Investment Corp (NRZ ) at $18.47 per share. With its quarterly dividend payout of 0.5 dollars per share, this latest buy has a dividend yield of 10.82% and will pay me $13.5 every quarter. Awesome! NRZ has been on my stock watchlist for a couple of months already, first discovered on dividendquest.com. There are two simple reasons I like this stock - it has a nice yield of 10% and it has increased the dividend payout for the past 4 consecutive years. Not quite an dividend aristocrat but still good. Another reason I like this stock, it has a dividend payments in January, April, July, and October. NRZ currently is trading close to all-time height. Now, I bought this stock close to its 52 weeks high and it worries me a little bit. As they say, we have been in the 9-year bulls market, and things could go south anytime soon. On the other hand, my investment is rather small to worry much about. Time will show. For the rest of the year, I'm looking to get a dividend income of $13.5 from this stock, which is about 1.1% from my $1,200 goal for 2018. There are not many quarterly paying stocks in my portfolio yet. Having NRZ in it, feels good.